You’ve heard the term “busy as a bee” and as it turns out, honey bees have an essential role in our food chain and especially to almond farming. At Maisie Jane’s, we care about bees because almonds need bees to grow, and we need almonds to bring you our healthy, delicious products. Why are bees important to almonds? Bees are a significant part of the almond-growing process at Maisie Jane’s. Bees hives from local bee keepers are brought to our almond orchards to assist with pollination because almonds are not self-pollinating. As the bees move from tree to tree, they pollinate the almond blossoms, allowing each fertilized bloom to grow into an almond. In a nutshell, without bees, there would be no almonds; and without almonds, we couldn’t make our healthy, delicious almond products. 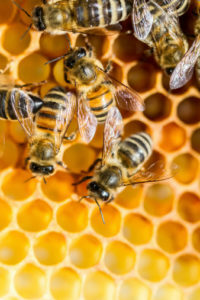 Bees play a vital role in roughly one out of three bites of food we take, including nuts, berries, and other fruits and vegetables. Beekeepers lost more than 40 percent of their honeybees between April 2015 and April 2016. It’s a trend of loss that has held a steady course since 2006. The pollination average for almond orchards is two hives per acre. In the 2015-2016 growing season, California had nearly 900,000 acres of almond trees, translating to a need for almost 2 million hives. Beekeepers are losing 40 percent of their hives every year. If you had 100, in that year you will get down to 60 and have to rebuild. About half of [beekeepers’] operating income comes from pollination practices – not just almonds, but other foods that pay for pollination. Plant bee-friendly wildflowers to help facilitate a diverse diet for honey bees – feeding on the same crop for honey bees is like if you were to eat chicken every day, ultimately it lacks nutritional value. Buy and consume honey to help support beekeepers – selling their honey helps beekeepers take care of their bees and fund research. Don’t install a beehive in your backyard — think of it this way, Jaguars are on the endangered species list, but you wouldn’t get one thinking it will help their fate. Purchase Maisie Jane’s almond butter – when you purchase any 12oz. jar of our almond butter at any Whole Foods market in the nation, we’ll donate $.05/jar towards bee research. There are small, yet significant things you can do to help protect the bees and make sure they are thriving in the future. Maisie Jane’s California Sunshine Products, Inc. was founded on strong beliefs and passion for offering unique, flavorful, top-quality, nut products. We strongly believe in earth-friendly practices that start on our family owned and operated orchards. We use Organic farming practices and continue in the process by using all natural ingredients with no preservatives or GMOs. We believe in honest, friendly and helpful customer relations at all levels. We take pride in every task, every day, with every person.